Evinrude E-TEC-powered boats picked up trash along the Milwaukee River basin during an Earth Day event on Saturday. 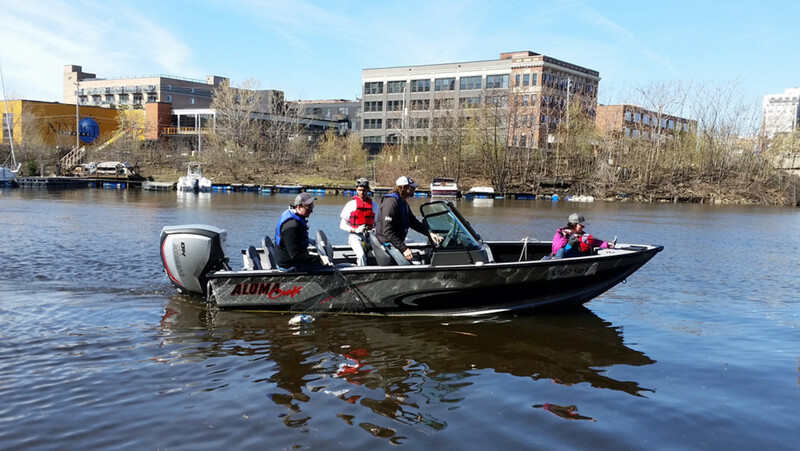 BRP commemorated Earth Day as its Evinrude brand took part in the Milwaukee Riverkeeper’s 22nd annual Spring River Cleanup on Saturday. Joining more than 4,000 volunteers picking up trash along the Milwaukee River Basin, 31 Evinrude employees walked the beaches as seven Evinrude E-TEC powered boats with 24 additional volunteers picked up trash in previously inaccessible parts of the river. The company also had a tent set up to distribute free fruit to volunteers at the Rock the Green Earth Day Celebration after the cleanup. “We take personal responsibility for the impact our products and our company have on the environment,” Evinrude director of global marketing and strategic planning Olivier Pierini said in a statement. BRP touts Evinrude’s E-TEC G2 engines as the cleanest combustion outboard engines in the world. The company has donated outboard engines to the University of Wisconsin-Milwaukee’s School of Freshwater Sciences for use on two research vessels. The company also said it has launched the BRP/Evinrude Water Research Excellence Fellowships. Two $5,000 inaugural fellowships were awarded to Brennan Dow and Christopher Suchocki. Dow is working on a harbor habitat assessment and mapping project in Milwaukee; Suchocki’s thesis could lead to a position in aquaculture or hatchery management.